Now as sumptuously packaged as they are critically acclaimed—a new deluxe trade paperback edition of the beloved stories. Now as sumptuously packaged as they are critically acclaimed—new deluxe trade paperback editions of the beloved stories. 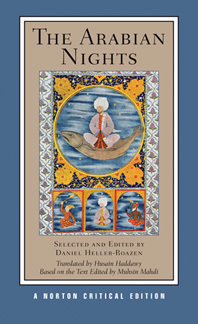 This Norton Critical Edition includes twenty-eight tales from The Arabian Nights translated by Husain Haddawy on the basis of the oldest existing Arabic manuscript. Few works of literature are as familiar and beloved as The Arabian Nights. Yet few remain also as unknown. In English, The Arabian Nights is a literary work of relatively recent date—the first versions of the tales appeared in English barely two hundred years ago. The tales are accompanied by a preface, a note on the text, and explanatory annotations. “Contexts” presents three of the oldest witnesses to The Arabian Nights in the Arabic tradition, together in English for the first time: an anonymous ninth-century fragment, Al Mas‘udi’s Muruj al-Dhahab, and Ibn al-Nadim’s The Fihrist. Also included are three related works by the nineteenth- and twentieth-century writers Edgar Allan Poe, Marcel Proust, and Taha Husayn. 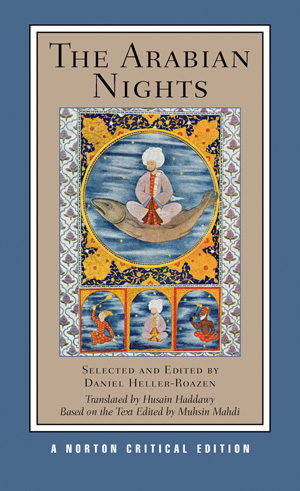 “Criticism” collects eleven wide-ranging essays on The Arabian Nights’ central themes by Hugo von Hofmannsthal, Josef Horovitz, Jorge Luis Borges, Francesco Gabrieli, Mia Irene Gerhardt, Tzvetan Todorov, Andras Hamori, Heinz Grotzfield, Jerome W. Clinton, Abdelfattah Kilito, and David Pinault. A Chronology of The Arabian Nights and a Selected Bibliography are also included.